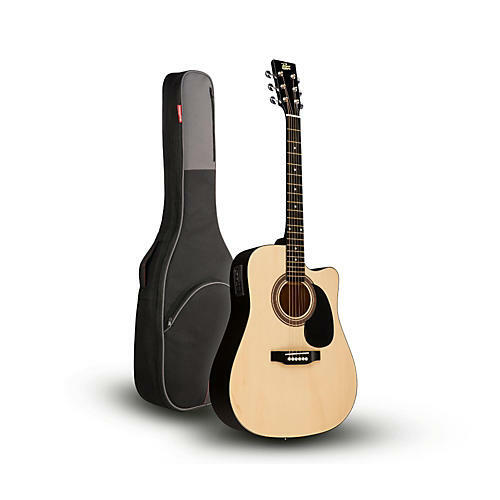 The super-affordable Rogue RA-090 Concert Acoustic-Electric Guitar is an excellent entry-level 25.4" scale guitar with laminate whitewood body and top finished off by a natural gloss to keep it in peak condition for years. Other features include a single cutaway, nato C-shaped neck, simulated rosewood fingerboard, simulated belly bridge, and an ivory color plastic saddle and nut. Rounding out its fabulous features is an Eden MET-A06 undersaddle pickup system with 3-band EQ and tuner. Includes a RR1AG gig bag.